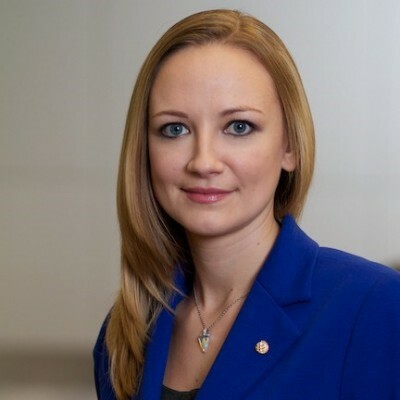 Anna Doudina (BSc ’06) credits her student career at York, and the advice of a friend, for putting her on a path to her current roles as a senior actuary in one of Canada’s largest financial institutions. “I was always good at math but was not quite sure what I wanted to do after graduation. Luckily I met a friend during my last year at York who told me about the actuarial profession” says Anna. A degree in pure mathematics and statistics helped Anna develop her natural ability with numbers, and as she approached graduation the idea of actuarial science stuck with her. She investigated the idea further, and ultimately decided to pursue professional training, and also landed a position at Foresters as an actuarial analyst. Joining Sun Life Financial in 2009, Anna’s career has continued to advance. Now Director of Group Retirement Services (GRS) Actuarial Financial Reporting, her team is responsible for financial reporting and financial modeling. In her previous role, she created a longevity research team within Sun Life, and now oversees a team of actuarial analysts responsible for actuarial valuation, modeling and analysis for the full range of GRS products. An active grad, Anna returned to York recently to participate in a career panel as part of York’s “Women in STEM” day. Her years of unique industry experience provided invaluable insights for the event’s attendees – mostly current York students. She is also a student mentor through York’s Career Centre. Anna is a Fellow of the Institute of Actuaries and a Fellow of the Canadian Institute of Actuaries. Her time at York helped lay the early foundation for a successful and rewarding career, for which she is grateful to her professors and colleagues.